This recipe serves at least 4 people and we usually have enough left for the next day. Pour 1 cup of basmati rice and 2 1/4 cups of water into a sauce pan and boil until the water is evaporated. Then wash the rice under cold water, so all the heat is gone out of it. Drain for two hours, then splash in 3 tbsp of light soy sauce and mix well. Prepare the vegetables and heat up your wok so it’s smoking, then add 2 tbsp of groundnut oil and fry the rice until it’s golden. Pour it into a bowl and clean the wok, before you heat it up so it’s smoking again. Then fry the vegetables and garlic in 2 tbsp of groundnut oil over a very high heat. Add 1 tbsp of dark soy sauce and 1 tbsp of oyster sauce and mix the rice into the vegetables and give it a good stir. Heat through until thoroughly cooked. Bring a large pan of water to the boil and add the pork. Return to the boil, skim and simmer on a low heat for about 30 minutes. Drain thoroughly. Meanwhile, put the star anise, cinnamon sticks, cumin seeds and dried chillies in a piece of muslin and tie together. Prepare your braising liquid by combining all the ingredients in a very large pot and bringing it to a simmer. Add the spice bag of spices and the pork, and bring back to a simmer, partially covered, while skimming the foam that builds up on the liquid. Cover the pot and simmer gently for 3 hours, until the pork fat and rind are very soft and tender. Remove the skin and cut the meat into small pieces. 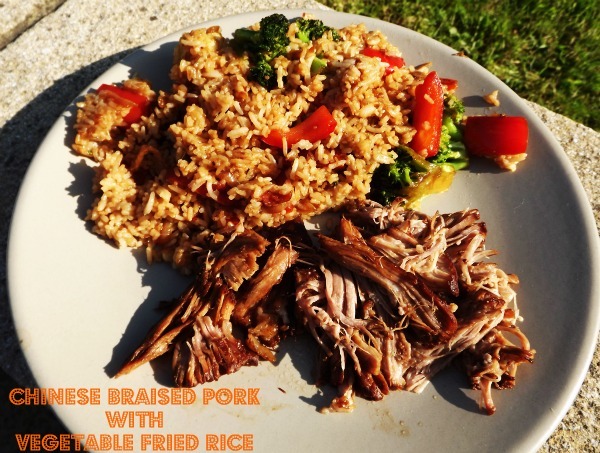 Plate up the Vegetable Fried Rice and the Chinese Braised Pork. Skim off all the fat from the braising liquid and reduce it by boiling it. Pour it over the meat to moisten it and serve. Enjoy and don’t for get to let me know what you think, if you decide to give it a try!